Washing powder for men: Do we need it? Washing powder for men? File under: "Products that it never occurred to me that you might need". Not only do we need them, but they are an important contribution to the gender debate, at least according to the companies selling them. In the US (where else? ), the unabashedly male-oriented detergent segment is a nascent but apparently growing market. There's not one - but three to choose from: Dirtyboy, Hero Clean and Frey. 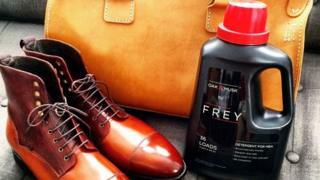 The last one Frey, comes in a black bottle (or "classic" and "rugged" according to the company) with a "cologne-inspired masculine fragrance" of oak and musk. The brand was set up and officially launched in the US last September - after a period of research and testing. And its ambitions are big - the website says the "detergent industry... is clearly genderised and outdated" and in launching the product the company hopes "to help break down stereotypes about who should do which household chores." According to Leif Frey, one of the two brothers to found Frey, there was a serious gap in the market. "It started out as a joke in college," he says. "We were finally doing our own laundry and we found that all the detergent was clearly tailored towards women." "Later, we realised it was a genuine problem. It perpetuates the stereotype that women should do the laundry". And, he says, his company's objective is "absolutely to change that". "We are helping to catalyse an important discussion and people are paying more and more attention," he adds. Leif says the company is seeing a 50% month on month growth rate and is in talks with big retailers and brand partnerships, although it is not yet making a profit and Leif and his brother do not pay themselves a salary. What makes a masculine scent? A masculine scent is supposed to smell fresh. There are three basic components: fougere (made up of oak moss, lavender and a black seed called coumarin), citrus notes and woody smells. Fougere is the most traditional (occurring in nearly 50% of fragrances) but wood-based scents are growing in popularity. Citrus-related smells are also often used in unisex brands. Americans in particular tend to like a fresh, clean smell. In Frey's oak and musk - the oak would probably be designed to give it the masculine scent while the musk is more of a natural, skin-like smell, which should appeal to the desire for freshness. If this all sounds a somewhat whimsical, or even unnecessary, market you are not alone. Leif says he gets that response a lot. He compares it to shaving foam. It used to be seen as a chore to use, he says, until the explosion of products on the market, and now people are more excited about shaving. He wants to do the same for laundry. "[Frey] is a step in the right direction. Anything to make men hate washing a little bit less." This vision chimes with an advert produced for Ariel India earlier this year encouraging men to "share the load". In it a father apologises to his grown up daughter for not setting a better example around the house and shows him helping with the washing at the end. The company says the advert has been shared 26m times across social media platforms since its launch in February, winning praise from Melinda Gates and Facebook's Sheryl Sandberg, who described it as "one of the most powerful videos I've ever seen". The woman's campaign group, The Fawcett Society, says they're all for encouraging men to share chores more equally. But it is sceptical about the need for a particular detergent. "There's nothing that stops men using the product right now and on the whole it's not helpful to create more gender distinctions based on stereotypes," says Jemima Olchawski, head of policy and insight at the group. "I don't want to berate them for trying, but the key is - whose responsibility is it? "No-one likes doing the washing, but it's not the type of washing powder that's stopping men from doing it," she adds. Leif readily admits that he is playing into a male stereotype but argues that the industry is so extremely "genderised" that a neutral brand just wouldn't have a strong enough impact. Surveys show that it is still largely women who do the washing - although that is changing. Data from the market research group Mintel shows that in both the US and the UK women are most likely to assume responsibility for the washing but that younger men are more likely to take charge of it than older men - suggesting a generational shift in attitude. But perhaps more importantly - what about single men? The latest data from the US census bureau shows 47% of adult males are unmarried and there has also been a sharp rise in the number of men living alone - so presumably they have to do their own washing (unless they have maids). In the UK, more men than women live alone, and the number of men between 45-64 on their own is rising (kicked out for not doing the washing perhaps?) The consumer analyst Tom Vierhile at the market research company Canadean says this could be a large part of what's driving a trend in the US for more men to do their washing. In which case why not have their own washing powder? And yes, Hero Clean also offers washing-up liquid, air-freshener and a multipurpose cleaner for men. As with many things in life, men have slightly different habits to women. Mr Vierhile points out that men tend to do their washing less frequently, sort less and are less likely to change the setting on the washing machine. This means that the companies aimed at men tend to emphasise their stain removal efficiency - even if said stain has been there for a while. But when asked what was the most important factor in buying washing detergent, men didn't on the whole say that it was the scent of musk or leather, nor tough, manly packaging that was a priority. It was, for the most part, the price. Not so different from women after all?